I confess it’s been a long time since I’ve marbled anything — cake or otherwise. 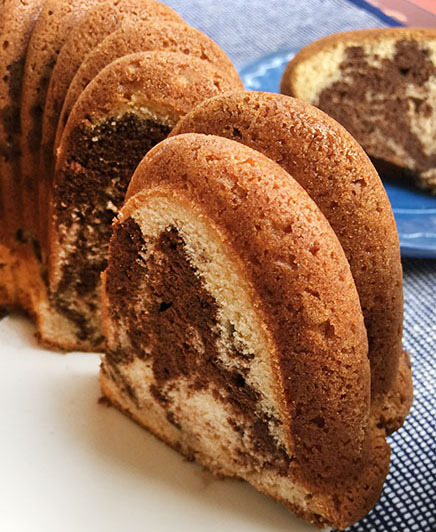 I do believe the last marble cake I may have made came from a mix. 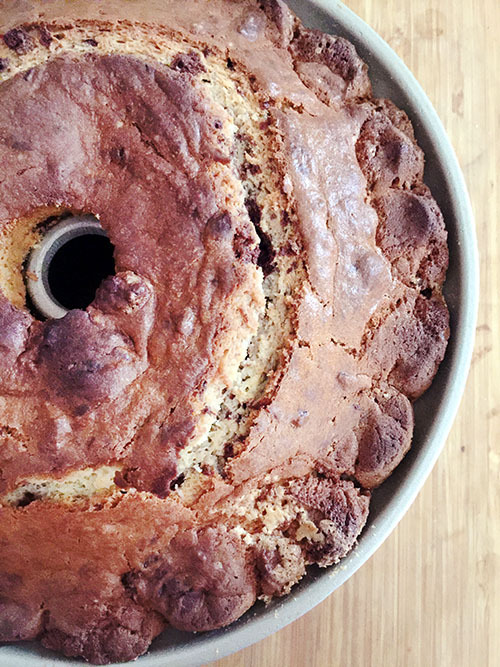 So, I was delighted to give the Marble Bundt Cake on Baked Sunday Mornings (recipe here: http://bakedsundaymornings.com/2018/09/28/in-the-oven-marble-bundt-cake/) a go. One of the things about this recipe I loved before I even set to making it was the fact that it was in the “Breakfast” section of the book, “Baked: New Frontiers in Baking” by Matt Lewis and Renato Poliafito (2008). I — as well as other kindred spirits I’ve known over the years — have long believed cake could be a great way to kick off the day. 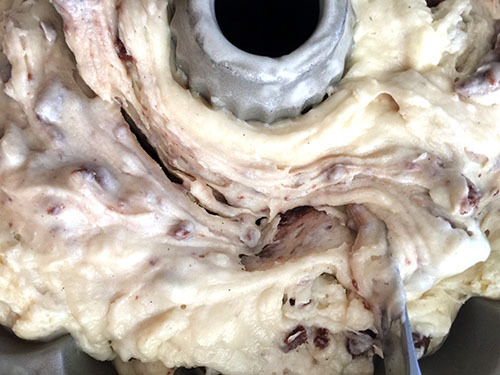 And debate this if you will, but the only thing often separating cupcakes from muffins — traditional breakfast fare — is a title, and perhaps an absence of frosting. 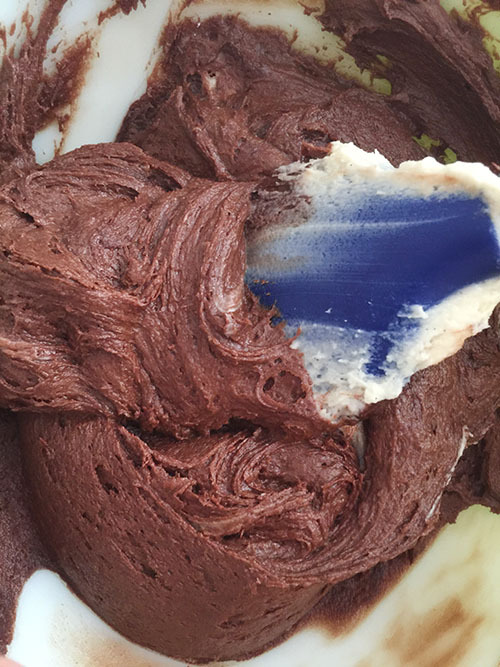 There is no frosting for this cake recipe (although you could probably glaze it delightfully with a chocolate ganache), but there is chocolate. 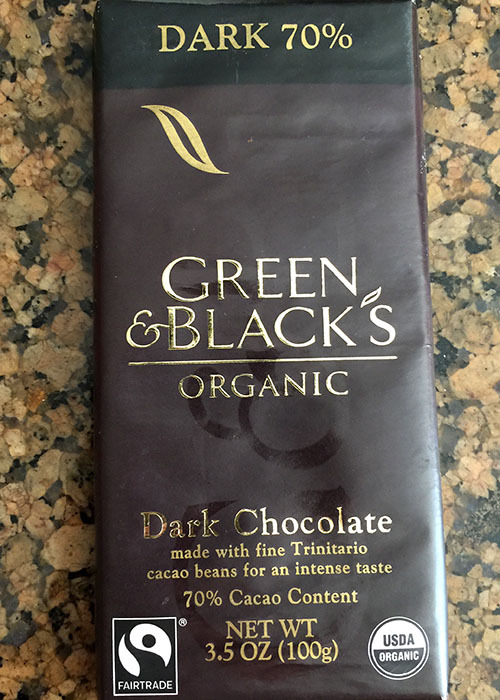 Dark, bittersweet chocolate is melted and rich Dutch process cocoa is blended in, laying the groundwork for the dark swirls to come. 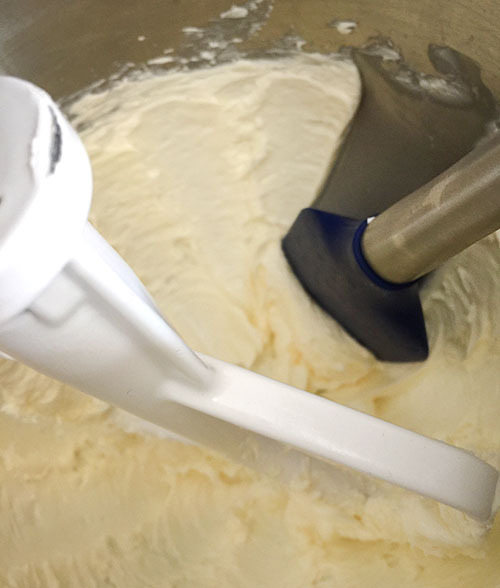 The cake batter is essentially a sour cream poundcake, beginning with a cup of butter, then blended with sugar, eggs and vanilla and 16 ounces of sour cream (!). 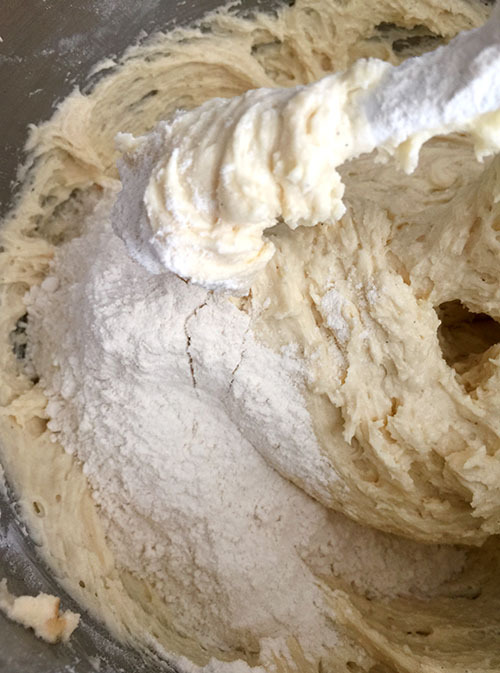 Flour, baking soda, baking powder and salt are stirred together and slowly added in, resulting in a voluminous and thick cake batter. 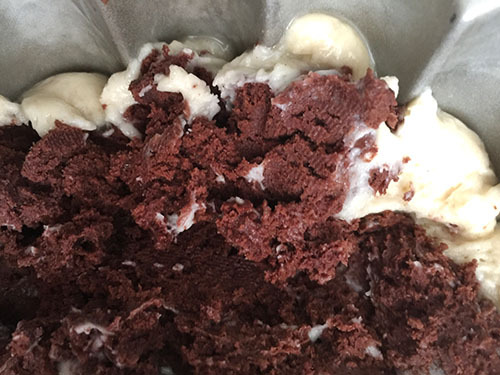 I mixed what I concluded was about a third of the vanilla batter into the melted chocolate/cocoa mixture. I might have misjudged the amount, however, as it seemed like it might be a little too thick to be swirl-able in the vanilla batter. No time to fret! 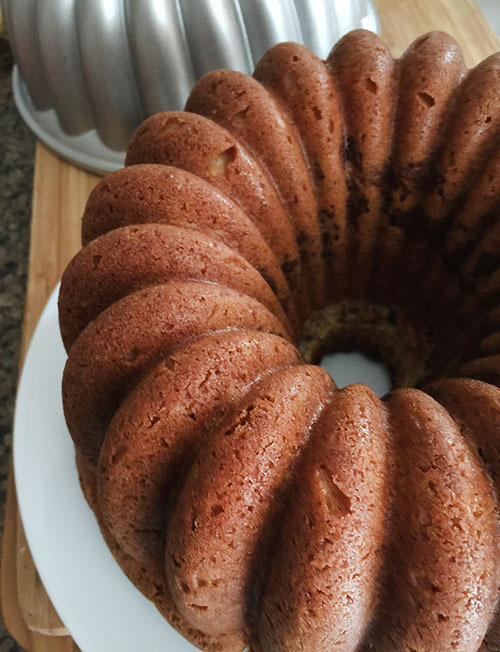 One must Bundt! 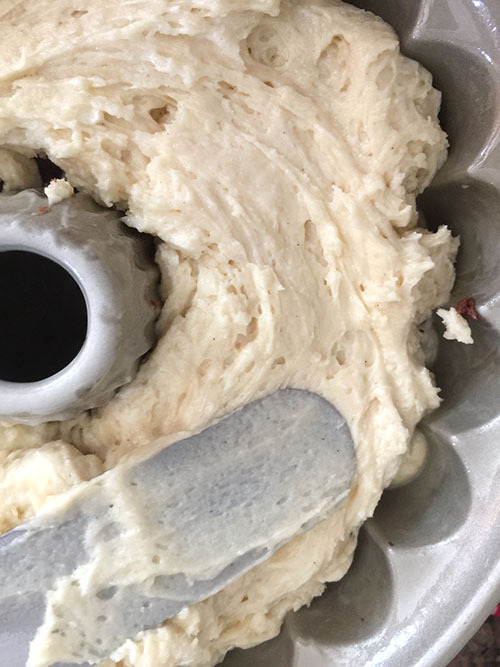 I was excited to make this Marble Bundt in part to do a trial run of my new “party slice” Bundt pan, which has many more scallop-y crevices (and more defined slices) than your average Bundt. 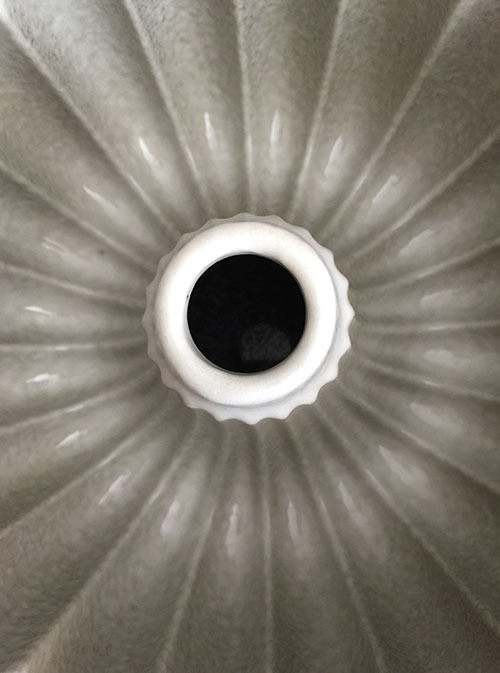 While Bundt cakes tend to be easy to make, one place they can be tricky is in the un-molding, so I exercised great caution (learning from experience), and wielded a heavy, thorough spraying of baking cooking spray in my pan. 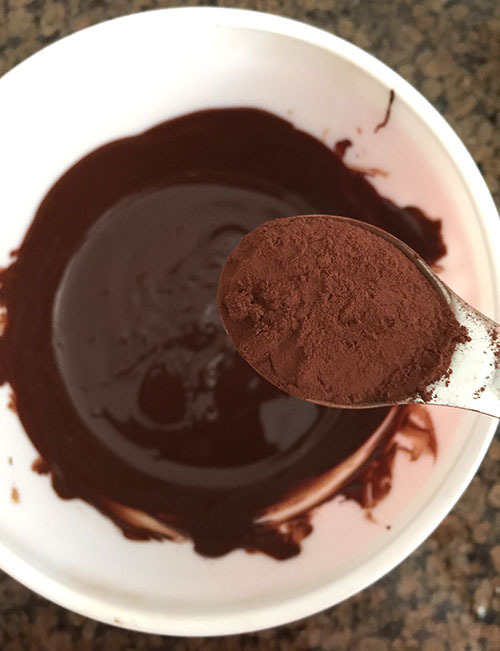 I layered half the remaining vanilla batter into the pan, then topped it with my chocolate batter. Sure enough, “swirling” became more wrestling. I wrestled the chocolate and vanilla batters together as delicately yet thoroughly as I could, hoping the marble result would be adequate. Another layer of vanilla batter and a bit more “swirling/wrestling.” The cake top was smoothed and placed in the oven. 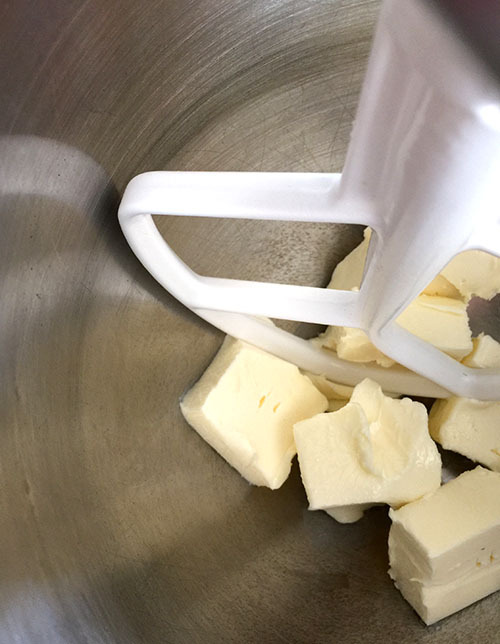 Once my baked cake — which bloomed a little above the rim of my pan — had cooled just slightly, I held my breath and used a pallet knife to loosen the edges a bit, then un-molded. The baking spray did the trick to release it easily and perfectly! I did wait (it was hard) for the cake to cool completely to sever up some party slices. The cake is dense, but moist, and my wrestle with dough did yield a marble-like effect (I think the marble process is forgiving). I liked how the cake was not too sweet, just enough vanilla (my favorite flavor), but punctuated with the right amount of chocolate for a fix there, too. Having a slice the next day, I considered the recipe recommendations of eating the cake warm and heated it a few seconds in the microwave (I think you could toast it, too)..,oh my, even better. 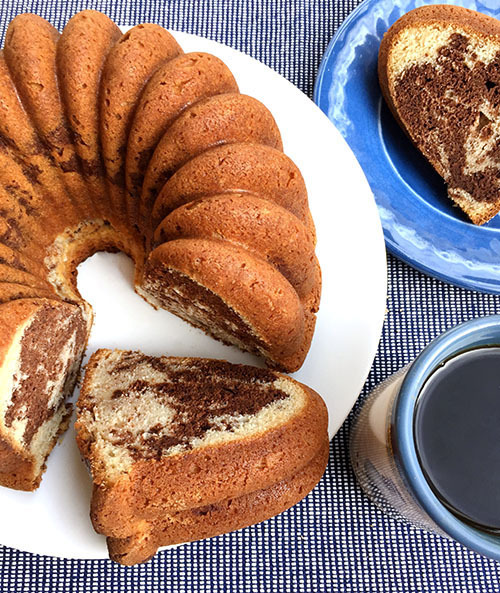 This cake could be the right warm, welcoming comfort for breakfast, or any time of day. 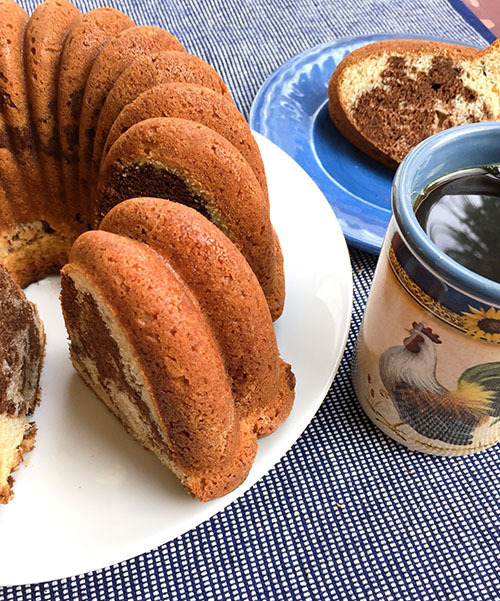 Blogger’s Note: For the Marbe Bundt Cake recipe, visit Baked Sunday Mornings http://bakedsundaymornings.com/2018/09/28/in-the-oven-marble-bundt-cake/.